We’d love your help. Let us know what’s wrong with this preview of Oahspe a New Bible in the Words of Jehovah and His Angel Embassadors by John Ballou Newbrough. 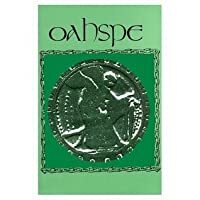 To ask other readers questions about Oahspe a New Bible in the Words of Jehovah and His Angel Embassadors, please sign up. 1. We believe there is but one ruler in the universe, and He is the Creator, the Great Spirit, the Almighty, Jehohvih; all was and ever shall be. 4.We believe that every individual is responsible for his own acts, and that no man can carry the sins of another. 5.We believe each individual born into the world is a child of the Creator, and that all men are brothers. 6.We affirm the universe is governed by the law of the Creator, which is absolute, eternal, unchangeable and is sufficient reason for all things seen and unseen. 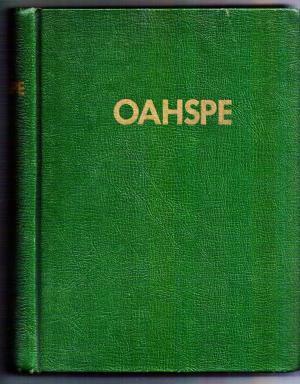 7.Although we believe no book is infallible, we accept the Oahspe Bible as our guide to daily living. 8.We believe it is our duty to help our brothers and sisters of the Human Family; to give love, wisdom, truth, and service and to do these at every opportunity in order that they may learn to help themselves and others. To become ministers, administering to others. 9.We believe the greatest satisfaction and happiness of one's life is to serve others, especially the young. Raising them up to work with the hands and well as the mind and teaching them to work in communities, to establish the worship of the Father, and to help bring about His Kingdom on Earth, and world peace and brotherhood. 10.We believe that any desire, thought, or act, which will injure one's self or another except in self defence, to be unjust and immoral. We abjure war or violence, discard of conflict in any form, and will not aid or abet in it. And we believe it is our duty to live in Peace and Harmony with the entire Human Family. To strive to overcome all tendencies of hate, jealousy, malice, conceit, envy, deceit, and all forms of physical, mental, emotonal, and moral weakness. To increase knowledge of one's self, of life, and of nature; and to use this knowledge properly for selfimprovement; to work toward spiritual developement of love, wisdom, peace, universal understanding, that we may be of greater service to God, our Country, our community, and our Fellow Man. Oahspe has no mortal leader. It is a Bible from Jehovih to teach man to hear and speak with his creator. Found this at a church junk sale for a buck, and couldn't turn down what promised to be a pretty laughable read. I didn't read the entire thing, because it's just WAAAYYY too much nonsense to wade through. Many of the names are clearly invented, written in such a way as to sound Old Testament-y. It is hilariously full of bull. It really gives an insight into just how weird nineteenth-century religion could be, and how bizarre a phenomenon automatic writing was. Massive. Baffling. Weird. Incredible but thought-provoking. Refer also to easy-to-read books by Laura Horst. I've read and reread this trying to find the magic in it that David Gascoyne, British Expatriate poet, found in it. The issue: said magic is not in fact present. Gascoyne was under the influence of an early form of amphetamine at the time and this is what made it important. WTF! i keep this book around to scare the crap out of myself when i'm feeling particularly open to far out ideas. either there was some heavy duty crazy in this guys noggin, or we are wrong about nearly everything. even if its little bit of both, i'd still be quite concerned.